Each and every business in the UK today has a duty to dispose of their trade waste in a responsible way, in line with the latest Waste Regulations. The Environmental Protection Act 1990 imposes on all businesses a legal “duty of care” to ensure they take the appropriate steps to ensure their waste is stored and disposed of safely and to document it in the waste management plan. There is a waste hierarchy which aims to reduce the amount of waste that ends up in landfill and increase levels of reusing and recycling. Alternative Methods of Disposal – a business is charged with showing they have done everything they can to dispose of any rubbish in another way including prevention, reusing, recycling and recovery before turning to disposal. If you think that your business isn’t affected you’re definitely wrong. It’s not only industrial premises and commercial kitchens who are bound by this Duty of Care. The law applies to small start-up companies and huge conglomerates alike. Different sectors have specialist sections but the general rules apply to all. The penalties, if you fail to meet Waste Management Guidelines, can be very severe. The first and foremost reason is simply it’s the law. If your business causes any environmental damage it is wholly responsible and there is no limit on the level of fines. But businesses should also be willing to look at their influence and realise that environmentally friendly practices will work positively for the company’s image, both to their own consumers and business partners. Having a written environmental policy will have positive PR results. But part of that includes keeping everyone informed, including staff members and sub-contractors. Having a waste management policy can also lead to savings. Monitoring the levels of waste can highlight areas where the business is operating inefficiently and how to make savings. Examples include reusing or recycling the waste or changing to efficient processes or using better materials. 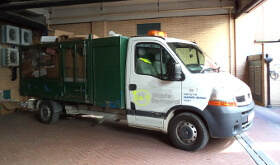 There are plenty of companies offering waste management services but 247 Waste Removal are definitely worth considering. They are authorised carriers and can offer waste removal services for offices and shops as well as white goods disposal, garden waste disposal and house and garage clearance services. More than 10 years’ experience in the industry means they’ve the knowledge and expertise to deal with all your rubbish quickly and responsibly. This entry was posted in "Waste Management" on Tuesday, October 14th, 2014 by 24/7 Waste Removal.